where it's used can result in inventive ways to design your space. You probably know the basics when it comes to lighting in your home: A table lamp here, an overhead light there, maybe a reading light in your favorite nook. And while these lights serve important functions from room to room, there's a wealth of beyond-basic ways to decorate with light throughout your home. Here are a few bright ideas for trying something new in your space. 1. Try: A low, low floor lamp. We tend to think of floor lamps as providing general light to a room, or more focused illumination over a sofa or chair. But there are also floor lamps that balance the functionality of a light and the design of a sculpture or object. When lit, these fixtures provide ambient "mood" lighting, rather than direct or general lighting that help illuminate a task at hand. These ultra-low floor lamps work well as an object in the room—try it next to seating, in front of a bookcase or pushed to the corner of a smaller room. 2. Try: Pendants as Bedside Lamps. It's genius, really. Installing pendants from the ceiling frees up your bedside for more books, jewelry you forgot to take off—or, nothing at all if more space puts your mind at ease. Make it easier to drift off to sleep knowing that as you flail for your alarm in the morning you won’t accidentally knock the lamp onto the floor. Yes, been there, done that! Nix the table lamps in favor of some that swing from the ceiling and can be installed at the perfect level for reading. Measure carefully, or better yet, hire a licensed electrician to make sure they’re balanced out just right. 3. Try: A Chandelier in the Bath. Using a chandelier in the bath area is a way to introduce some decorative intention and glamour to the space as well as bring additional ambient lighting. Lighting from bath bars and wall sconces focuses on tasks like shaving, applying make-up or styling hair. Installing a chandelier over the tub, in the center of the room or in a corner infuses the space with overhead pampering! If you have lower ceilings, install a piece that sits closer to the ceiling. If you have a corner spot, longer lengths could cascade through the space, creating sculptural interest. Keep in mind light source effects: Incandescent options offer the most flattering lighting, LED gives off the most amount of light (and lasts the longest) and, while fluorescent is also energy efficient and cost effective, it is not as flattering to skin tones. 4. Try: Double-duty Light Objects. When it comes to bath lighting, who says you have to see the actual light fixture? Integrated LED mirrors are lit from within, hiding the light from view but providing plenty of illumination for daily bathroom activities. LED lighting also provides the most amount of bright white light possible and is ideally suited for kitchens and bathrooms. Bonus? Because it’s a mirror and a light in one, it’s a one-stop installation with a clean, finished look. 5. Try: Light as Art. 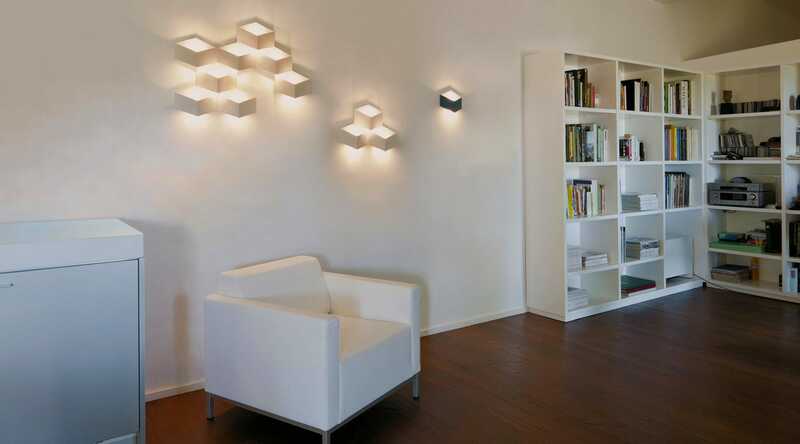 This is a newer concept in lighting that is both functional and fantastical. Sculptural, lighted fixtures grouped together merges practicality with beauty and serves as an artistic element in a room. Many wall lights are suitable for use indoors and out, and also work on the ceiling, so you can create a seamless experience by installing them in both an entryway/porch area and also inside on the hallway walls or ceiling. Or, stagger the heights along the wall or rotate them to create specific artistic effects. You can also line them up in a row for a more consistent look and smooth-edged lighting output. Depending on the space you have to work with, you can use one or group multiples—the options are near limitless. Trying something new and unexpected with lighting in your living spaces can transform a space, and we hope these ideas provide some inspiration for yours!